I have always worn a polar bear charm, which I’d like to consider a good luck charm. I guess it was just about time to include it into one of my illustrations. 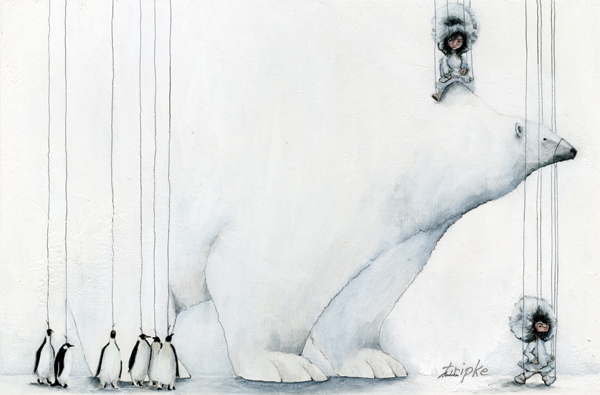 In order to make the design more intriguing I added strings to the penguins as well as the eskimos – it gives the illustration some of the needed contrast, too. The illustration is done in prismacolors, acrylics and a lot of (white) gesso. This entry was posted in Blog, Home and tagged a little bit weird, abstract, Illustration, mixed media, whimsical on July 11, 2010 by admin.